Recently recognized and known to me only from the literature. It seems close to Xerocomus badius, but is distinguished on the account of the paler coloured dry velutinous cap, somewhat reminding Gyroporus castaneus or Xerocomus moravicus. 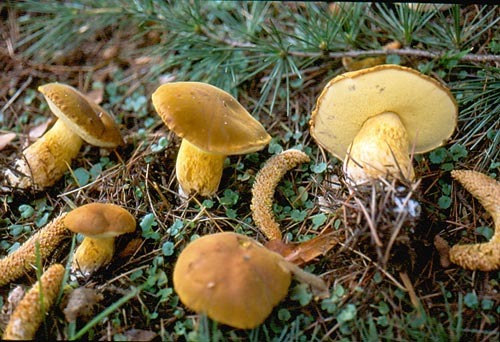 From Xerocomus badius it is distinguished also by the pileipellis which is not gelatinized and is composed of hyphae with numerous congophilous granules . Habitat. Recorded under Cedrus atlantica. Distribution. Blum’s materials were collected in France and Alfredo Riva’s collection illustrated below originates from Switzerland. Note. 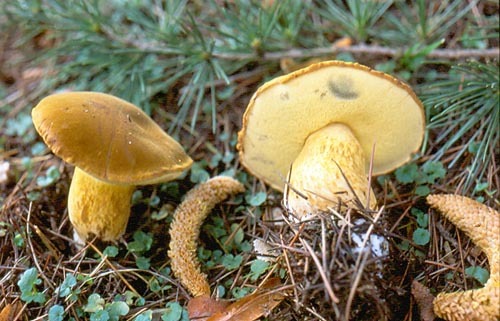 This is not Boletus heterodermus Singer, which is invalid later homonym of B. heterodermus Blum. Riva, A. 2011. Xerocomus heterodermus comb. nov. – Schweizerische Zeischrift für Pilzkunde 89: 200–203.